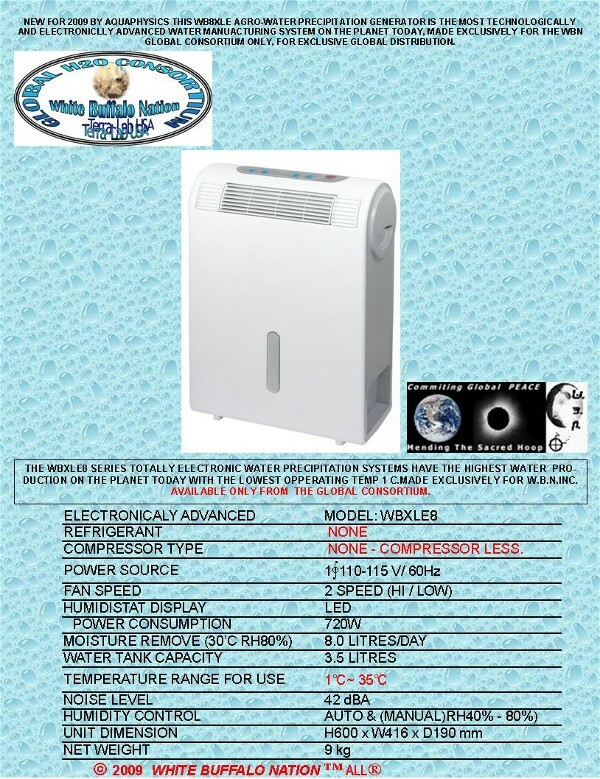 ATMOSPHERIC WATER GENERATOR TECHNOLOGY IS NOW OBSOLETE WITH ALL OUR NEW ELECTRONIC WBXLE SERIES SYSTEMS FOR 2012 NOW GLOBALLY AVAILABLE. MAKING THE MOST WATER ANYWHERE ON THE PLANET. THIS WATER IS THE PUREST WATER ON THE PLANET IN BOTTLES OR OTHERWISE RIGHT FROM THE AIR. The Consortium of Global H20 (water)Manufacturers IS NOW PRODUCING ULTRA-WATER MORE PURE THAN DEW DRINKING WATER FROM NEVADA AIR IN 750 Ml RECYCLED GLASS RETURNABLE BOTTLES. IN CRESCENT VALLEY, NEVADA, AND LOMPOC, CALIFORNIA AND MIAMI, FLORIDA. CLEVELAND, OHIO FACILITY SOON TO BE UP AND BOTTLING. 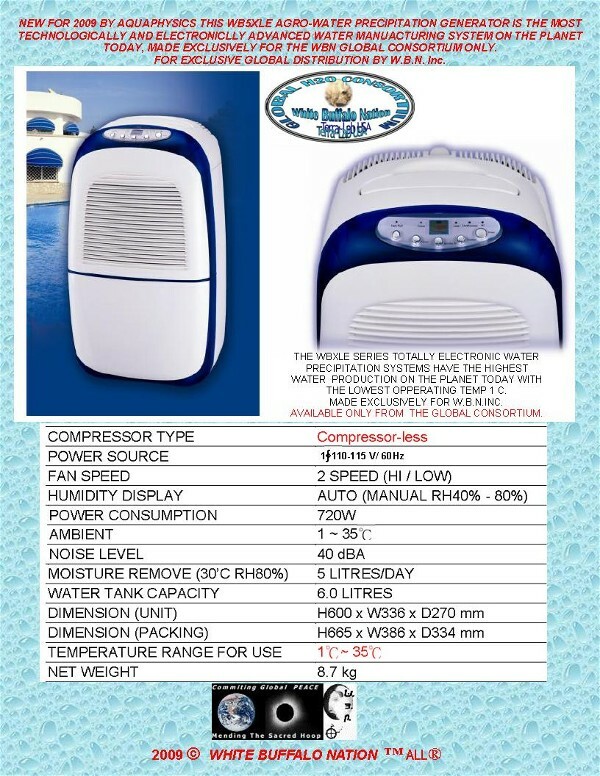 ATMOSPHERIC WATER GENERATOR EMERGENCY LIFE SUPPORT SYSTEM. WB2000: Produces 35,000 gallons a day without an evaporizer with an evaporizer about 50,000 gallons a day . 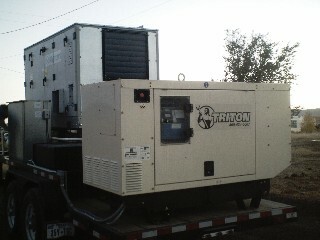 WB 6000: Produces 105.000 gallons a day without an evaporizer and with about 150,000 gallons a day. WB 12000: Produces 210,000 gallons a day without an evaporizer and about 300,000 gallons a day with 70% humidity and 85 degrees Farenheit . These larger Generation plants can be combined in any number of units to produce an unlimited number of gallons a day. Feel free to call us with your Needs or Questions any Time. The first Custom Atmospheric Water Generator Water-bottling plant in Jakarta, Indonesia Is producing thousands of liters of pure bottled drinking water as you read this. Geo-thermal BTU's for an inexhaustible supply of energy either from the Global oceans or our vast Mountain Ranges. 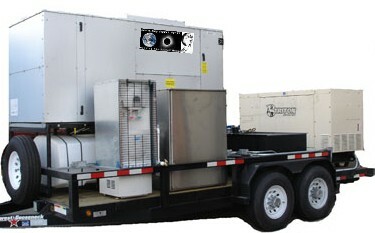 Our newly Patented Perpetual Hydrogen Electrical Generation systems are now available for world wide distribution. Think of how much air will be purified and COOLED for Mother Earth, TO HELP WITH GLOBAL WARMING, and again no worries of Terroristic contamination. These Custom units to bottling machines, produce the highly popular oxygenated “bottled water” Atmospherically made for Commercial and Industral sale. Think of the many jobs this will create, besides producing the purest water on the planet. ULTIMATELY AN INSTANT ECONOMIC BOOST FOR ANY GLOBAL COMMUNITY ! Atmospheric water bottling plant available machines also blow molding and bagging units. WAS ON DISPLAY IN CRESCENT VALLEY, NEVADA. PLEASE CALL 775-374-0596 TO FLY IN. The CU 3012 60/50Hz Models has a 30KW generator (10 KW for other uses) 350 gallon water tank, 200 gallon fuel tank on a 8' X 18' trailer and produces 231 Gallons a day @ 85* F, 70% RH & uses 17.5 kWh @ 85*F, 70% RH = 1.92 kWh / gallon 12 tons of refrigeration. A complete, self-contained and self-sufficient system which includes an atmospheric water generator, storage tank and a power generator, all installed and mounted on a trailer. The system can be transported from place to place, with units that can produce thousands of gallons of crystal pure, fresh drinking water every day in remote, hard to reach locations. Great for Gold mining, Gem mining, traveling shows, Disaster areas (Fire, flood clean-up,Tsunami, hurricane (as was in Katrina )or tornado relief), Desert Military maneuvers , Military bases or air-lifted any place on the Planet. Another Homeland Secure Pure Anti-bacterializing Water Supply ( with an added Silver Mineralizer). MADE BY MUNTERS IN THE U.S.A.